Saute a couple carrots (1/2-inch chopped) and one chopped leek (white and light green parts) in olive oil for about 5 minutes. Add one chopped garlic clove and saute for an additional minute. Set aside. Bring 4 cups water to a boil with 1 cup dry lentils, 1 turnip (cut in half) and one whole (peeled) onion stuck with 6 cloves. Once boiling, add the carrots and leeks, reduce heat, and simmer about 20 minutes until lentils are tender. Discard turnip and onion, strain lentil mixture, and toss in a bowl with 1 tsp. unsalted butter. In a separate bowl, make a Dijon vinaigrette. (1/4 cup olive oil, 2 TBPS red wine vinegar, 4 tsp. Dijon mustard, 1 TBSP kosher salt, and 1 tsp. black pepper. 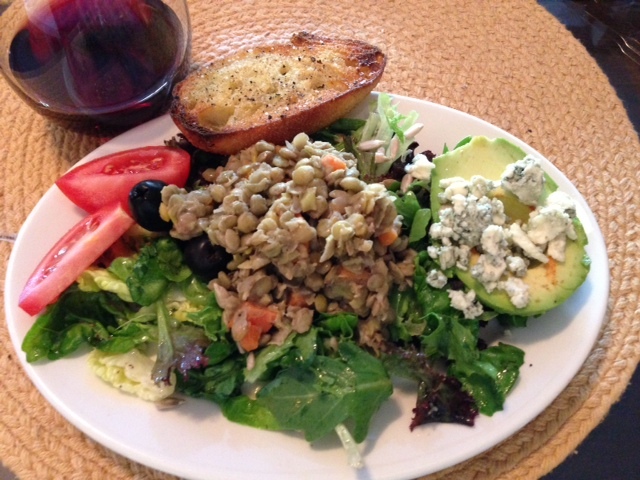 Add warm lentils to vinaigrette, toss, and let stand for about 15 minutes. Ready to enjoy!